3 Tips to Help You Have a Worry-Free Summer + $10,000 Sweepstakes! Summer is all about fun: family vacations, day trips, hiking new trails and splashing the day away in the community pool. My family looks forward to our extra time together all year. We don’t want anything to get in the way of our good times! Unfortunately, summer also comes with a few not-so-fun surprises that can really put a damper on our excitement. Forget those days when bad weather rains on your parade, allergies, sore feet, and achy muscles can really do a number on your fun too! Luckily, Bayer® is here to help! No, they can’t control the weather, but they can really help you conquer a few of those other seasonal woes! Let’s see how! Have a Worry-Free Summer with Bayer®! Do you have any favorite tips for a worry-free summer? Share in the comments! If you suffer from allergies like I do, you know that they can really put a damper on your outdoor fun. It’s kind of hard to enjoy a beautiful view while hiking if your eyes are itchy and watery, and all that BBQ food doesn’t taste quite the same with a stuffy nose. Help take a break from allergy symptoms with Claritin®. It’s non-drowsy so you don’t need to slow down to smell the roses (unless you want to, of course). One of the best things about summer: all the cute shoes! Let’s be honest, though, they don’t exactly provide the support our feet need! Then there’s the hiking. Oh, the hiking! So much fun, but killer on the feet! Hello sweet cushiony comfort! Grab a pair of these and stay on your feet longer. Dr. Scholl’s® even makes a high-heel version for summer date nights. I love summer road trips but I don’t love the throbbing back pain I get from all that time in the car. This summer, nothing is stopping my family from hitting the open road. ALEVE ® helps relieve a whole range of pain from backaches to headaches. You can ride pain-free in the front while the kids sing their hearts out in the back. To be sure these products are suitable for you, always read and follow the label! 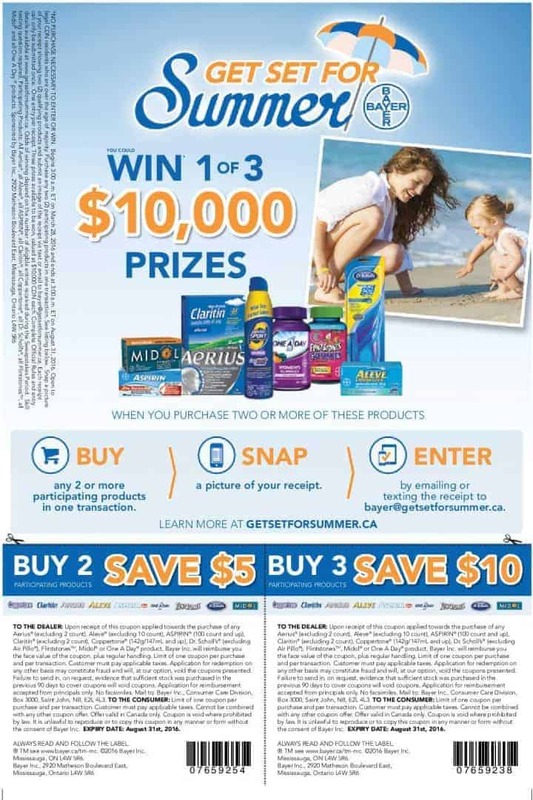 Bayer® wants you to #GetSetForSummer with a special summer promotion, giving Canadian families the chance to win 1 of 3 top prizes of $10,000. All you have to do is buy* two or more Bayer® products already on your summer shopping list, and text or email a picture of your receipt to bayer@getsetforsummer.ca. For more information and a savings coupon, head to www.getsetforsummer.ca. *No purchase entry option also available. See contest rules for details. Ready for an awesome giveaway that you can enter right here? 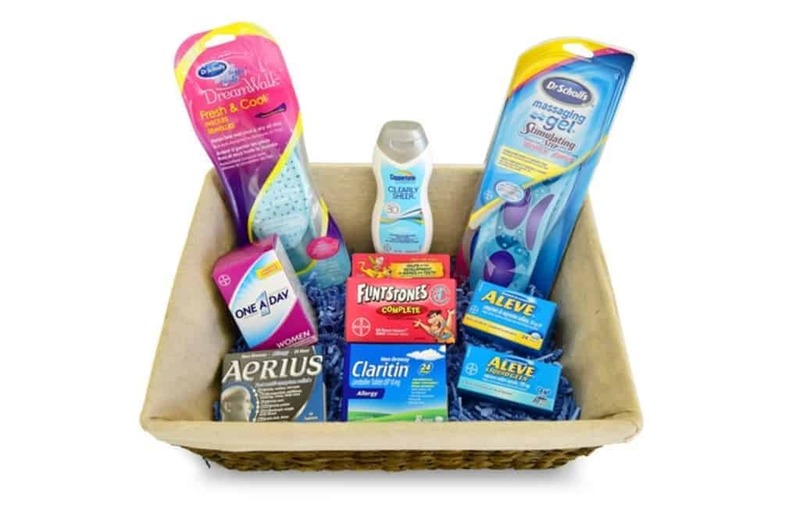 We have an awesome gift basket filled with Bayer® products to help you get set for summer! Giveaway is open to Canadian residents age of majority and ends on July 15, 2016. Please note that, due to the nature of some of the prizes, you must have either tried the products in the basket OR want to try them. Enter below for your chance to win. Update on July 20th, 2016: Thank you for participating! The giveaway ended and the winner Ivy P. was notified. This post is brought to you by Bayer®. All opinions are our own. Can I Dye My Hair When Pregnant? I’m most looking forward to trying the Dr. Scholl’s For Her Comfort Insoles. My feet would LOVE to try the Dr. Scholl’s Massaging Gel Insoles! I am most excited to try the Coppertone Sunscreen! I’d love to try the Gel Soles. I suffer from seasonal allergies and would love to try the Claritin. I would love to try the Dr. Scholls Massaging Insoles! The Dr scholl’s insoles look like they would help. I’d love to try the Dr. Scholl’s insoles & the Aleve, my mom swears by it! I am looking forward to trying the Claritin for our allergies. I would really like to try the Aleve, I have heard good things about it! I would like to try the Dr. Scholl’s Comfort Insoles and the Coppertone. The gel insoles…..my feet need some relief!! I most look forward to trying Claritin for my allergies! I like the Dr. Scholl’s insoles and look forward to trying them! My feet perspire and ache after lots of outdoor activities in summer. So, I look forward to trying the Scholl’s inserts. I look forward to trying a lot of products from the gift basket, but today after a long day on my feet I would say that I am most looking forward to trying those gel inserts! I am most looking forward to try the Coppertone Clearly Sheer because I am always in search of a good sunscreen to have around. I could use the Dr Scholls insoles. I am most looking forward to trying the gel insoles. I have never tried Aleve. Would love to try it. I’d like to try the Dr Scholls Massaging Gel insoles. I’m most excited to try the massaging gel insoles! I want to try the gel insoles but the vitamins look good too! Aleve is my go to medicine. Helps with my arthritis. I would like to try the Dr. Scholls gel insoles. I would love to try out the Dr. Scholl’s® For Her® Comfort Insoles!! I use the Aleve regularily so that would be great to get more in my stash. Definitely the shoe insoles, much needed for work! Winning this basket would actually save me money because I use both Aleve & Aerius! My daughter has Flintstone Daily Vitamin Everyday!! All are great products already used in my home and I am single mom so it would be great to save some money!! I am looking forward to trying the Claritin. I am looking forward to trying the Aleve. I would love to put those Fresh and Cool inserts in my summer sneakers! I walk a lot in the summer so I’d really like to try the Dr. Scholl’s insoles. Would love to try the Aleve, have read good things about it but have not tried it yet. The Aleve and the Dr Scholls Massaging Gel insoles sound would be welcome! I would really love to try the Gel insoles. I’m looking forward to trying Claritin. I’m most looking forward to trying the Dr. Scholl’s® For Her® Comfort Insoles, they sound very comfortable. I am most looking forward to trying the Dr. Scholl’s insoles. I am looking forward to trying the Dr. Scholl’s For Her Comfort Insoles. I am most excited to try the one a day vitamin! This basket has lots of awesome products in it, hard to choose just one. products are also great though. The shoe inserts for sure! Looking forward to trying the Claritin. Aleve, to help with my shoulder pain. I am most looking forward to trying the Dr.Scholl’s For Her Comfort Insoles for my tired feet! I am looking forward to the Coppertone Clearly Sheer as I love looking for that perfect sunscreen. I have been doing a TON of walking so far this summer. I want to try the Dr. Scholl’s® For Her® Comfort Insoles!! Insoles can make all the difference in the world sometimes. I just started using them and I love ’em! I love the Dr. Scholl’s® For Her® Comfort Insoles. Allergies are the worst here! Even the dog has allergies. We take off our shoes at the door and change into house clothes to minimize spreading allergens from outside in the house. Looking forward to trying the massaging gel foot pads. This is a very nice product arrangement. And your list is spot on! That’s a nice giveaway! I appreciate the simple tips as well, direct to the point. I tend to have some body pain every now and then from my trips and Aleve is a name I’m very familiar with but haven’t picked up since. I find Aleve one of the few medications that give me quick relief from a headache. I haven’t tried Aerius yet, so I would like to do that. I always use another allergy medicine. It’s good to have all these essentials to keep the family safe this summer. I’m sure it’s going to be useful especially since flu and colds are common. It’s good to be prepared! These are great tips. I have to use Aleve for my terrible headaches sometimes. Aleve is so wonderful for my arthritis! I’d rally have a worry free summer if I won 10K!! These are some good solutions. Hay fever has always been a big problem for us so we do tend to pick up Claritin this time of year. These are great tips for a worry free summer! Thanks for sharing them! These are all great solutions to common problems. Our upcoming summer travel plans involve a lot of walking, so picking up some Dr. Scholl’s insoles is a wonderful idea! Summer allergies are the bane of my existence. Claritin is one of the few things that helps me get through the summer. I would love a gift basket filled with those great things too! We are big fans of claritin in this house. Allergies are absolutely the worst! With the spring comes my nasal congestion. There are more than one product I could really use and do use regularly. Thank you. So much fun! Great tips for a worry free summer. We are super excited summer is here and will be using pretty much all of this all summer long! Aleve is my and my husband’s jam. I get a really sore back from working at my desk all day, and he gets sore from all the outside stuff he does. I`m looking forward to trying the Aleve! Helicopter Parenting: Are You Ruining Your Child’s Future?